The Chesapeake Bay retriever lab mix is a crossbreed between the Chesapeake Bay retriever and the Labrador retriever. Designer dogs are now very common in our current world. Probably, your neighbour owns one of those and you now feel that you might want to try out one too although you know nothing about designer breeds. Well, I assure you that you’ve come to the right place. However, we are not always sure that these designer dogs have taken up the characteristics of the parent breeds on 50% each. There are chances of multi-generations crosses too. In that case, I will guide you through a few important details you should be aware of before considering to adopt this particular mix. health conditions and how to care for her. This dog can trace her origin back to the two puppies who were rescued in Maryland in 1807 from a foundering ship. The male was sailor and the female canton which were known as Newfoundland dogs. With time however, she was recognized by the America Kennel club where since then a few alterations have been made to the breed. She was used by market hunters to retrieve waterfowl and ducks in Maryland’s Chesapeake Bay although still did pretty well as a family companion. She goes by the nicknames; CBR, Chessie or Chesapeake. This breed is globally known for her prowess in hunting and swimming therefore categorized under the sporting group of dogs. dense coat that is wave like to aid her in swimming. she is aggressive towards strangers and foreign dogs. •CBR loves water and has a great dedication to her swimming and retrieving skills. especially cats but if only they grew up together. but any interaction between dogs and kids should be supervised. from an equally strong trainer who can be in full command. This is because they can be territorial and tend to dominate meek and timid owners. feel comfortable relating with them. •Her lifespan goes up to 12 years. •An average dog of this breed stands up to 2 feet high with a weight of about 80 pounds. she needs brushing 2-3 times a week. protect her coat from harsh weather conditions. hiking and walks around the park. She energetic therefore regular exercise will keep her healthy. hip dysplasia and eye problems. If you neglect this dog and she gets bored, she is destructive. All in all, toys and vigorous exercise can keep her in check. With the above mentioned facts about our first parent breed Chesapeake Bay retriever, we now have a clue of what to expect in the mix. The Labrador retriever can trace her origin to the North Atlantic where she was used to fetch ropes and retrieve fish among other uses. Today she is a popular dog breed in the USA and UK as an energetic disability assistant dog. In other cases, she is trained as a law enforcement tool to retrieve narcotics. She makes an ideal pet for those families that love outdoor activity. Her energy levels will surely amaze you. ideal for a great show dog. owing to her original use as a waterfowl’s retriever for hunters. short and dense with black, chocolate or black colours. ideal family dogs as they get along with children. •She is also loyal a companion. •The lab is very submissive and always eager to please her master. hence she would thrive better in a yard than in an apartment. would not be good as guard dogs. keep her away from destructive chewing. she can retain her abilities throughout her life. •Her life span ranges from 10-14 years. •She weighs about 70 pounds and towers about 24 inches high. hip dysplasia, eye problems, elbow dysplasia, allergies among others. The Labrador retriever is our second parent breed to our mix. We have analysed her general characteristics which you should compare to her first parent breed before opting for cross breeding. Now we will venture in to our hybrid the Chesapeake Bay Retriever mix. Looking at the temperament of parents is always important in order to know what to expect from the hybrid. Here is the outcome of breeding the Lab and Chessie. 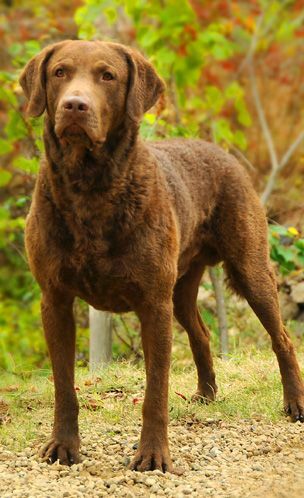 Chesapeake Bay Retriever Lab Mix is commonly known as Chesador. this mix should make a good companion. She gets along well with children and other household pets if raised with them from when she is a pup. The hybrid is a very large dog mix with a muscular body fit for her retrieving nature. The Chesador is affectionate and loves being involved in family matters. Being a pack animal, she can suffer from separation anxiety if left alone therefore leading to destructive chewing. She needs early socialization to curb bad habits that may develop. with a height of 26 inches. she needs occasional brushing especially during her shedding seasons. You too need to get a good vacuum cleaner to keep your carpet free of her furs. More to that, she needs regular baths especially after a long day of play outdoors. However, you should do it moderately to avoid drying out her skin. This is one very energetic dog that won’t work for you if staying indoors with movies is your lifestyle. She needs someone equally agile so that they can go out together to explore. This trait owes to her parent breeds who are both hunters and great swimmers. Make sure you engage her in activities like hikes, runs and swimming to keep her healthy. This will help to keep her distracted and tame any separation anxiety that she may be prone to. Note that you should never tie up your canine or lock her up because that is rather inhumane. She is intelligent making it very easy to train. therefore make sure you remain positive. Always reward her with a biscuit when she does well in her classes. in order to retain their skills throughout their life. Lastly, ensure that she is properly socialized to both humans and other dogs. Like most dogs, she has one or two genetic health problems that she is prone to. This however can be curbed by looking for a breeder who can offer a health guarantee certificate for the puppies. He should also be honest about the diseases this puppy would encounter later. Some of these diseases are hip dysplasia, eye problems, allergies among other health conditions. We have seen that this is a very adorable breed that will gain easily affection from her owner. The hybrid is hardworking and talented especially in swimming making her an ideal play mate. However, the breeding decision entirely depends on the buyer. Be sure to make a wise decision! 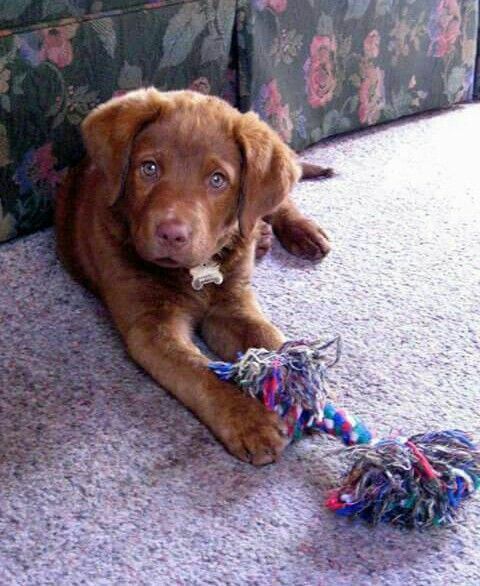 2.Chesapeake Bay Retriever Lab Mix. (2018). Shopforyourcause.com. 3.Club, A. (2018). 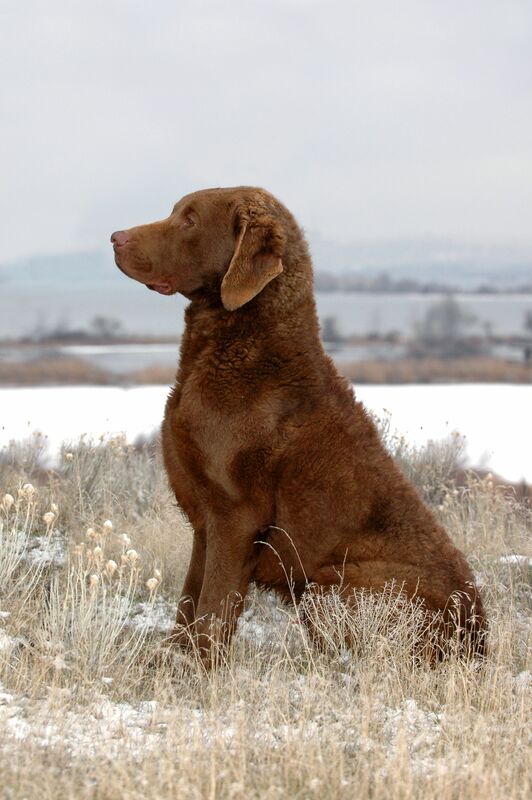 Chesapeake Bay Retriever Dog Breed Information. American Kennel Club. 4.Club, A. (2018). Labrador Retriever Dog Breed Information. American Kennel Club. 5.Retriever, C. (2018). 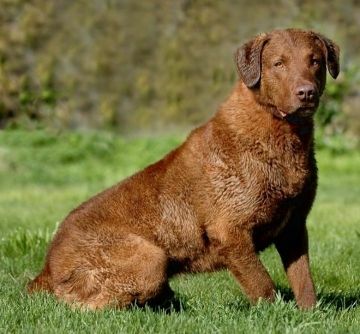 Chesapeake Bay Retriever Dog Breed | Information on Chesapeake Bay Retrievers. 6.Retriever, L. (2018). Labrador Retriever Dog Breed | Information on Labradors. Petwave.com.